Progress on the upcoming development release has been steady for the last several weeks. A number of contributors, some new and some old, have been helping to reach this milestone. I was hoping we'd have this ready by the end of the year, but a January release date is more likely. The only major work that remains is event scripting and a small amount of map design for a single map. Since this is the last update before this release is available, I want to give a brief overview so expectations can be set accordingly. This development release will contain the entire content for the first chapter in the Allacrost saga, with the exception of one side quest mission. I'd estimate it has between 1-2 hours of playtime. Some aspects of the game will either have clearly missing content, be incomplete, or contain obvious bugs (although we're trying to make sure no game-breaking bugs are in this release). Examples include: some artwork will be missing, the game balancing will be sub-optimal, the dialogue may be unrefined, and so on. It is important to understand that this is an unrefined and imperfect snapshot of the game and to treat it as such. Understandably, not all people will want to play the game in this sort of state. We have several motivations for releasing the game in this state. We look forward to sharing this important achievement with you soon. It's always nice when we can show visible progress to our players instead of just talking about it. Over the last month or so, I invested a lot of time improving and extending some of our existing map artwork. 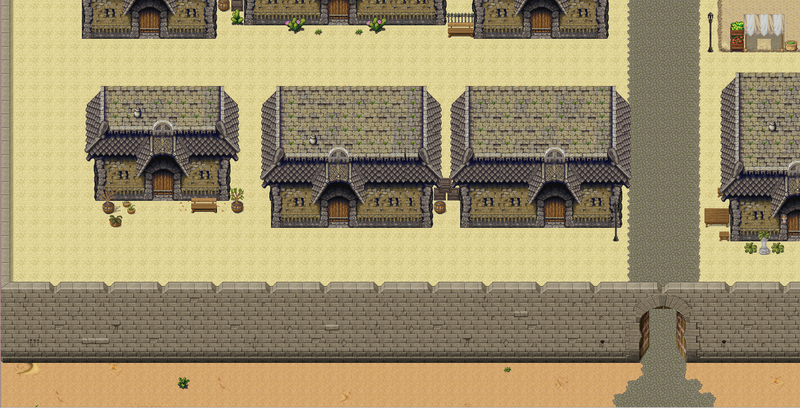 These improvements allowed me to greatly improve the map design of the first city players will visit in the game. Below you can see a couple before-and-after screenshots of this city from our map editor. This is still a work in progress. If you have any feedback for us, drop by our Discord channel. It has been quite some time since our last update. The reason for that was quite simply that there was no news to share. Myself and others on the team were simply too busy with other things in our lives and sadly this project had to sit on the sidelines. That period is now over thankfully, and I've committed myself to at least the last three months of this year. I have a strong desire to finish what we nearly were able to accomplish last year. That said, our goals for this project have not changed. Publish a development release where you can fully play through the game, followed by an official release shortly thereafter once we've perfected and polished it. The time line for when these goals will be achieved is more nebulous now, but I am optimistic that the development release will be finished before the year's end. Here's a glimpse on what's going on at this moment. Recently we made the difficult decision to remove a feature from the game that has been around since the very beginning. That feature was called MAPS, an acronym for multiple attack point system. The idea behind MAPS was that instead of targeting an enemy to attack, you could target a specific area of the enemy such as their head or arms for a different effect. Attacking the head would deal more damage, but be harder to hit. Attacking the legs may trigger a status effect that lowered the enemy's speed. And so on. The motivation was to make battles more interesting and strategic. Sadly, in practice this feature didn't work out so well. Most battles were too short and the various trade-offs between the attack points were too inconsequential. Additionally, the feature could be confusing to players and selecting actions in battle had a somewhat clumsy workflow as a result. More recently, the battle fatigue feature was introduced to the game and it achieves many of the same goals that MAPS intended to. We felt that both of these features together made the game needlessly complex, and so opted to keep the better of the two. Last year a spent a lot of time working on the largest and most complex map that this project has built to date. The map itself is nearly completed, but after play testing it I realized it was just...boring. Buildings were lined up in rows and looked identical save for small variations in size or decorations. Some of the art on this map was also full of artifacts because although the art itself was fantastic, it did not repeat well across multiple tiles. My current work aims to address. I've spent the past few days reformatting the existing art to remove these slights and make the tiles more repeatable. I'm adding sets of improvements, additions, and variations as well so that the same set of art can produce many different looking structures. Once that work is done, I'm taking a hammer to the current building layout of the map to improve the overall design. In addition, there are still a fair amount of bugs and features in the code that remain to be addressed. I won't go over all of them, but you can see our open issues here to get an idea of what needs to be done on that front. Don't forget to drop by our Discord channel if you have questions or just want to chat. Our last update in mid-September proclaimed that we'd have a development release ready in a couple more weeks. Unfortunately, that did not happen. The primary fault lies with myself. I had a lot of personal matters suddenly come up that took all of my time and attention. I quite simply had no time for this project, and many others on the team found themselves in similar circumstances around the same time. So we just needed to take a short break to take care of life. Now we're on the rebound and we're starting to make incremental progress again. I think we can definitely get our development release out by the end of the year, and our official release maybe a few weeks into next year. That all depends on if we can find the resources to fill in our missing gaps, however. Most of what we are missing at this point is art, sound, and writing. There was some talk on the team a few weeks back about opening up a new means to chat with one another. We've had our IRC channel since the start of this project, but IRC isn't for everyone (developers are the only ones who tend to use it) and we wanted to make it easier for anyone to come and join the conversations. So we setup a public Discord channel that anyone is free to visit. This service also has the advantage of saving chat history, unlike IRC, so we're able to read past conversations. Our IRC channel will continue to exist and we may hop in there now and then, but moving forward we'll be holding nearly all of our real-time discussions at our new chat channel. The forums will still be our primary method of communication. Great progress has been made since our communication last month. So here's what's going on. This release is still our primary focus at the moment and we're getting close. There are a lot of user-facing bugs and rough edges in the current build that we'd like to even out though, so the release might be delayed into early October. In my last post I revealed that I had been working solo for the past several weeks. I'm happy to share that is no longer the case, and we have a well-rounded team of eight individuals now contributing to the project in various ways. The larger the team is the more we can get done, and I expect that the team will only continue to grow in the coming months. We've been refining and extending one of our existing tilesets and the results have been pretty impressive. 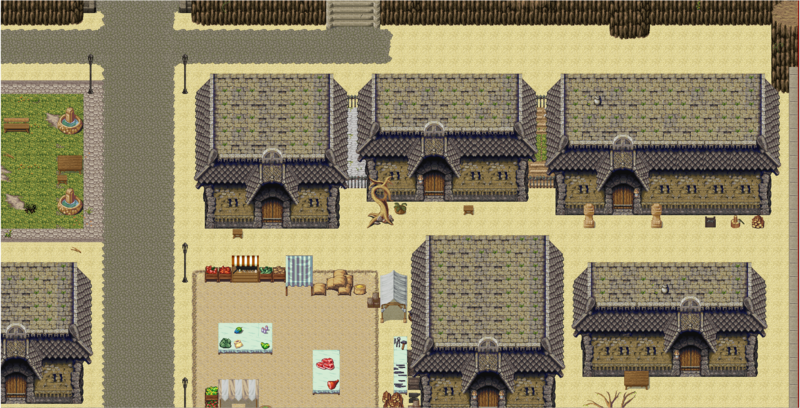 This tileset in particular is used for the interior of the homes in the desert kingdom of Harrvah and are pretty impressive (as the sample image below illustrates). This tileset has also been made available on OpenGameArt.org. Download it here and use it in your own games, provided you respect the license it was made available under. With this upcoming release we've found room for a lot of new music, some tracks which were composed years ago. Our primary composer, Rain, has put a couple of these on his SoundCloud page. If you'd like a preview of a couple awesome RPG music coming your way soon, you can have a listen here and here. Allacrost is a very old project by any standard, even though it hasn't been active in all the years it has been under development. Joining a project as large and historic as this one can be intimidating to a newcomer. With that in mind, a summary of the major events and challenges throughout the project has been added to our website under the about section. If you're interested, you can read about the project's history and learn why an effort like this takes such a long time, and learn about all the mistakes we made a long the way. That's all for now. Check back with us in 2-3 weeks, when the next development release should be made available. We'll be publishing our next release sometime next month. Like our last release, this will be a development release, meaning it's an unpolished snapshot of where we are at. Unlike our last development release, this release is going to be able to be played from start to finish with no major missing content. This is a pretty big deal, as we will be taking this release and adding embellishments, balancing, and design tweaks and turning into our official 1.0.0 release. Reaching that milestone will be a huge achievement. Although I don't want to speculate right now on when that release will happen, it's entirely plausible that it will be ready before the end of the year. There have been a number of improvements and reorganization of this website, which will make it easier for newcomers to learn more about the project. These updates are still ongoing, so expect more changes to come. Since our last update six weeks ago, a great amount of progress has been made (check out our updated roadmap). Most of this work has been in focused on finish the scripting for a large map and working out technical challenges that came along the way. A lot of doors have been opened with the new set of features that have been built for maps, which make scripting them much easier and more flexible than ever before. These challenges were the main reason why work on this map has taken so long; We simply didn't realize all of the holes and issues we still had when we began working on this map months ago because this map is more complex than any other we've ever done. Moving forward, map development will be much, much faster and less frustrating for our designers. On a related note, I'm planning to put together a short video series on our youtube channel soon to explain, at a high level, how maps in Allacrost work and how you can build one of your own. So keep an eye out for that. Despite all the progress that has been made, the fact is that this project has sadly been a one-man job since I returned to it back in June. I'm doing alright by myself, but as you can imagine a project of this size really needs to be built by a team, not an individual. I've begun looking for help so that our releases this year can be as great as they can be. If any of the following roles interest you, please head to our contribute page and find out how you can help. 2016 Status Update: Progress and Site Revamp It's been six full months since our last progress update. My last message left off with the expectation that the project would pick up again in January and see a release before the mid-year. That didn't happen, and the reason why was simply due to my lack of time to work on this project. And when I'm not active, sadly the typical case is that no one else is either. But things have calmed down to the point where I have the spare time and energy to work on Allacrost again, and have been doing so for a few weeks already. Here's an overview of what's new and what's coming soon. As you may have noticed, our site and forums have a new look. Our site had been running on a very old version of Drupal, and we finally did a major upgrade to it. The forums also needed a large update, but in the process our custom forum skin was not compatible with the new version. So we used an existing skin that was close to the color scheme of the old one. The wiki is also back online, after an extended period where it was unavailable. Finally, our old bug tracker has been officially retired and any remaining issues on there have been moved over to our issue tracker on our project page. Development resumed on the largest and most complex map this project has ever generated. In the process, we identified a couple technical limitations that were inhibiting us from generating the type of environment that was desired. After some research, we decided to build out a brand new engine component to handle notifications, which are essentially messages that one part of the code to publish to declare that something happened, and other parts of the code can detect this and act accordingly. Thankfully this work didn't take more than a week, and map development has now resumed. Along with our upgrades, different parts of the main site are slowly evolving with new and reorganized content. Our website hasn't been updated in ages, and there are several pieces of information that are no longer accurate. The site will still be relatively simple, but hopefully content will become much easier to discover and read through. I'm hoping we can put some advanced widgets on our front page, such as an activity tracker (number/size of changes made to the project repository) so it can easily be seen how active or inactive the project has been recently. In the meantime, please pardon any oddities you may see pop up on the site menus or other areas as pages are actively under development for the next few months. As was stated before, this is really the last big effort we need to complete before we're ready for our next release candidate. The main barrier remaining to map development is a lack of some of the necessary artwork, but I've been making place holder art in the meanwhile to fill these gaps. Once this chapter of the game is playable from start to finish, we'll release a "rough draft" and continue to work on refining and balancing it. With the end of 2015 nearly here, I thought I'd briefly summarize everything we accomplished. Before that though, we owe you all an update on what's been going on for the three months since our last post. The short answer is: not much. Half of the team (including myself) became very busy toward the end of the year, and the other half seemingly dropped off as well. It's unfortunate, but we've learned that these things will happen. With a team made up entirely of unpaid volunteers, sometimes we just need to take a collective hiatus. As such, our September release plans were not realized. We started out 2015 in a pretty sad state. I had been working solo for about four months trying to find a way to bring this project back. In January I completed the first step by doing a major overhaul and series of improvements to our map editor, which had been too difficult and cumbersome to use and really made the world creation process painfully slow. With this work complete, I began using this new tool to rapidly develop some of the largest maps this project has ever seen. With a little outside help, at the midpoint of the year this project put out it's first release in nearly four years. This was a huge turning point and created the positive momentum for what needed to happen next: rebuilding a team. A few weeks after this release we had a small but dedicated number of individuals working hard to understand what Allacrost was and improve upon it. Our focus turned to producing a second development release that improved balancing and added additional game content. Basically, the intent was to produce an unpolished but nearly complete version of our next official release. We made a lot of good progress on that front, especially with the help of two designers who developed some great ideas between the two of them to help realize Allacrost's vision. We invested heavily into improvements in battle design and UI layouts. The majority of that work had been completed, but there was still plenty left for us to do. Earlier in the year we also successfully migrated to a new host and repository management system (BitBucket/Mercurial) and it has greatly improved the collaboration and efficiency of this team. The last three months were unfortunately without progress. Recently I'm finding myself with time available for this project again, so things should pick back up in 2016. Our primary focus has not changed. We are still working toward the development release that was originally meant for September. The majority of the work needed for that release is development of the capital city map. Unlike the beginning of 2015, in 2016 we do not have any elements that are blocking us from making progress. We simply need to put in the time necessary to finish what we've already done. At this point it's hard to estimate when that next release will happen, but I'm optimistic that you'll see it sometime in Q1 2016. Thanks for all your support this year in seeing this project rise from the dead. A lot of large changes have been implemented in the last few weeks with regard to the battle mechanics in Allacrost. These are large design changes that were created to improve the battle experience and as such, I'd like to take a moment to discuss what these changes are, why they were made, and how we see them improving the gameplay experience. In the last release, our new designers identified several issues with our battle mechanics and experience. We started by identifying what sort of battle system we desired for Allacrost and decided to focus on the following. Players should have a long-term strategy to a dungeon. They shouldn't chose actions thinking only about the current battle, but future battles as well. You may notice that these traits align closely with the game's overall design goals. We threw around a lot of ideas to figure out how to realize a system that met all of these design criteria. And we came up with a central feature that meets this design, which we call battle fatigue. Below is an outline of how our new system with battle fatigue works. All characters are restored to full HP and SP at the end of every battle. SP regenerates a small amount every turn in battle. When a character loses HP, they accumulate HP fatigue. This fatigue reduces the max health HP of the character. When a character consumes SP (by using a skill), they accumulate SP fatigue. This fatigue reduces their max SP of the character. Fatigue persists between battles, meaning that the more battles the character party fights, the lower their max HP and max SP becomes. Fatigue is only removed by visiting an inn and resting. It is not something you can remove with an item or other readily available mechanic. Characters have two attributes that determine fatigue accumulation: stamina for HP fatigue, and resilience for SP fatigue. A higher stamina attribute causes HP fatigue to accumulate more slowly. The same holds true for resilience and SP fatigue. There are several implications to player strategy with this battle fatigue feature. If the player is constantly using their most powerful abilities to end a battle quickly, toward the end of the dungeon they'll find that their max SP is very low and they will struggle a little more against tougher enemies and bosses. At the same time, if the player is too conservative with their skill usage and takes too much damage from drawn-out battles, their HP fatigue climbs greatly and they have a lower max HP when they face the tougher enemies deeper into a dungeon. The player must develop a strategy and carefully manage both types of battle fatigue to be successful. Personally, I am very excited for these design changes to be fully realized. They are implemented and functional in the game already, but we need to do further balancing work in order for them to feel like they make the game a decent challenge, but not a frustrating and impossible one. Of course, these are not the only changes you'll see in this month's release, but they are definitely the most impactful. We look forward to publishing our first release with the battle fatigue feature and are anxious to hear feedback from our players on this new battle mechanic. It's been about six weeks since our last release and a lot of changes have been going on recently. If you read my post back in April, you know that we've been working with a very small team so far this year. I'm glad to say that this is no longer the case. We have a solid handful of individuals that are actively creating content and code for this project again. This is very uplifting news, and our progress has increased significantly. The only area where we could still really use some help right now is in our artwork department, but for the time being we have enough existing art and placeholder art to get through this next release. One of the criticisms that I heard about our project in general was that it was difficult to figure out what made it stand out from other games like it. People visiting the site for the first time weren't able to gain a good understanding of what this game was about and what makes it special. In response, the About page was overhauled to explain the game's major design goals and offer brief explanations of some of the core features that make Allacrost what it is. With the addition of our new team members, we've been taking a hard look at the game's design and are actively seeking to add, cut, or replace features as necessary to improve the gameplay and experience. More specifically, at the moment we are focusing on making our battle system more strategic, interesting, and enjoyable than it has been in the past. The battles present in our last release were incredibly simple and much too easy. As one player commented recently, the enemies were "uninteresting meat bags", and we're certainly seeking to change that through our design work and balancing. If you want a peek at what sorts of design changes we're currently talking about, head over to the design section of our forums. And if you have an opinion, please do share it with us! Your voice can help influence the direction this title takes in the near future. This release will be a huge step forward in bringing this project closer toward our major design goals. We hope you look forward to it, and check back with us next month to try out what we've been working on.